A screen grab of the webpage hosting my first accepted photo submission (graphic courtesy of WDTN.com). Serendipity is defined as a "fortuitous happenstance" or a "pleasant surprise" and Wednesday's widespread flash flooding from a string of strong spring thunderstorms provided me the opportunity to "dip my toes" into the real world of digital photojournalism without any preparation or advanced notice on my part. 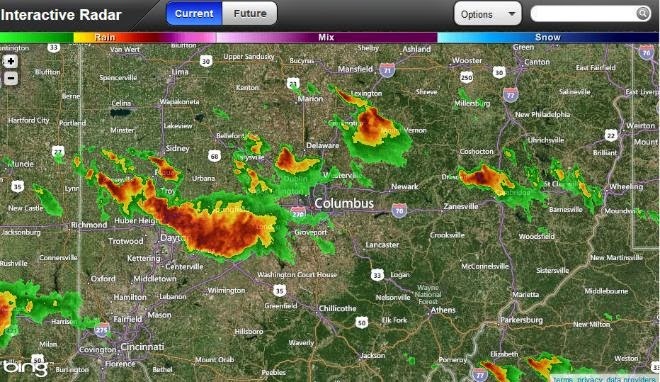 A Doppler radar image of severe thunderstorm activity across central Ohio on Wednesday evening (graphic courtesy of The Columbus Dispatch). Due to the higher probability of severe weather in this part of the country at this particular time of the year, our family keeps close tabs on notifications of pending meteorological situations. The first one came around 2PM for a severe thunderstorm watch for a wide area of west-central Ohio and the Miami Valley. 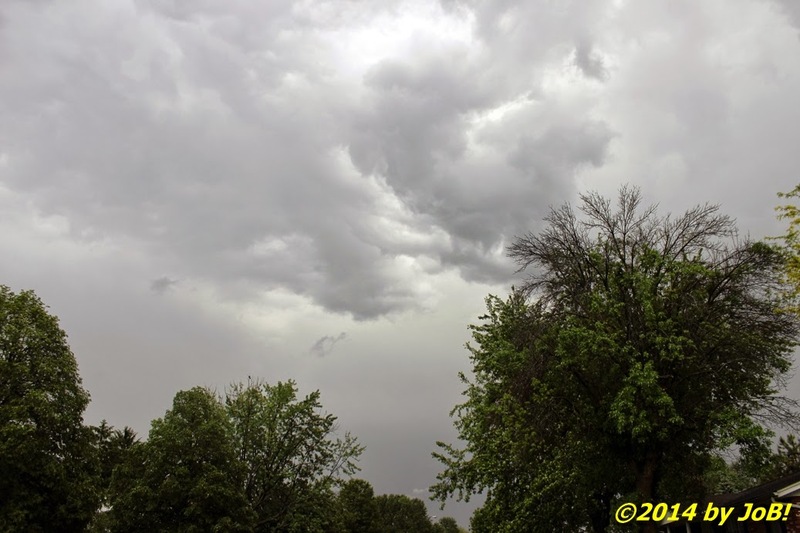 The warnings started coming about two hours later and it initially looked like all the rough stuff would stay north of our location (the east-west oriented Interstate 70 always seems to be a "dividing line" between active weather zones around these parts). Just before 5PM, a tornado warning was issued for the county just to our north but that was due to radar indications of wind rotation instead of someone spotting a funnel cloud. It was about that time that those separated storm cells started to merge and begin to travel on a east-southeast line that dumped the majority of their collective precipitation over the same area for several hours. Low ominous-looking clouds passing overhead during Wednesday evening's storms. 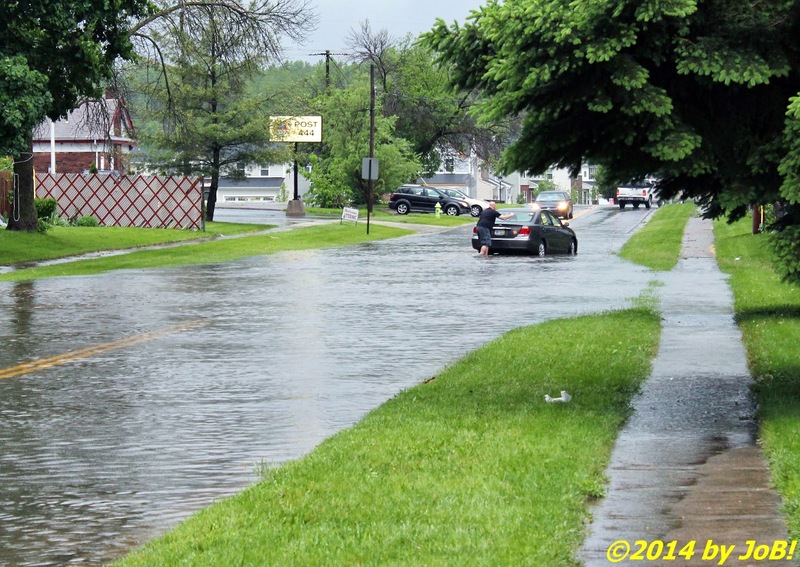 Many locations experienced extremely heavy rains that led to flooding of low-lying areas and other places where up to 2-inch per hour rates pooled quickly. 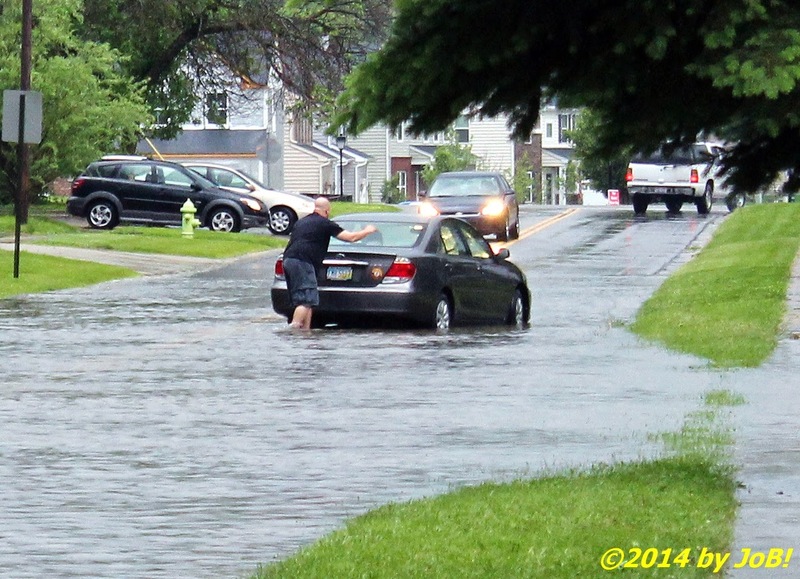 In addition to the local regular flash flooding locations, those quasi-biblical totals of precipitation overtaxed storm drains and sewer systems and turned roads and sidewalks into lakes and rivers. After one of the major cells passed by us, I decided to prep my camera and explore the neighborhood to capture this rare occasion. 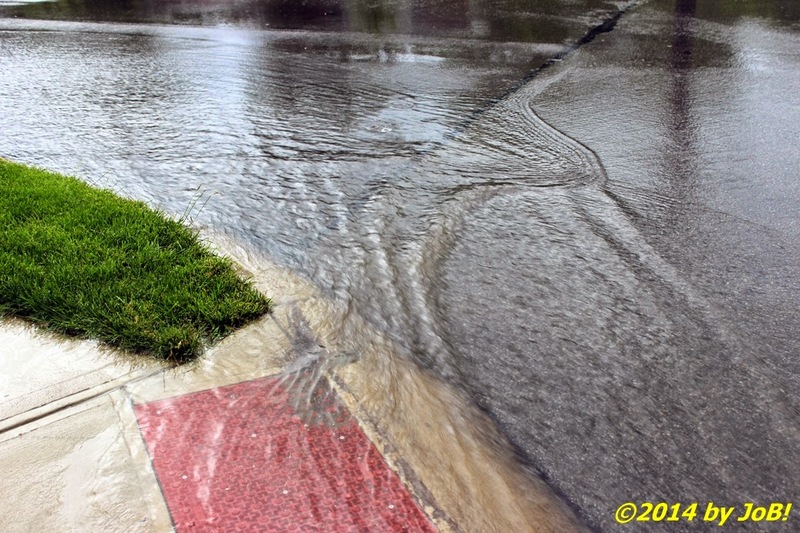 At one location, I was fixated on the patterns of the water flowing across the road when I noticed an irregular sound pattern of vehicular splashing coming from a main tributary of the subdivision. 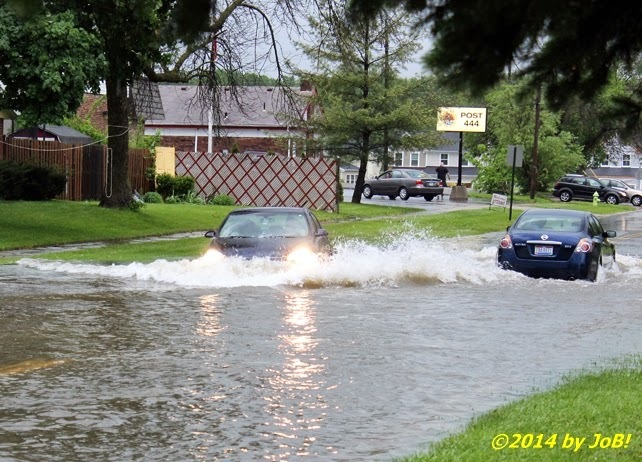 Water from two streets combine into one downhill flow during Wednesday evening's storms. 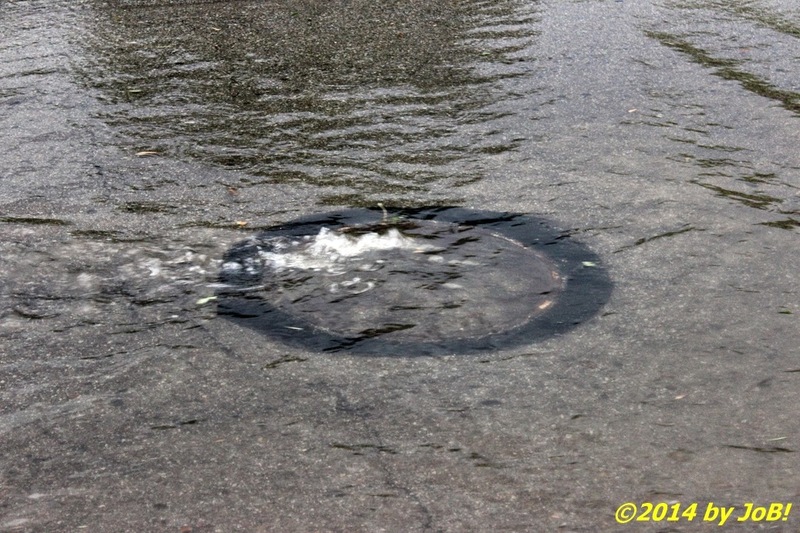 Air bubbles forced their way through a submerged manhole cover's grating during Wednesday evening's storms. 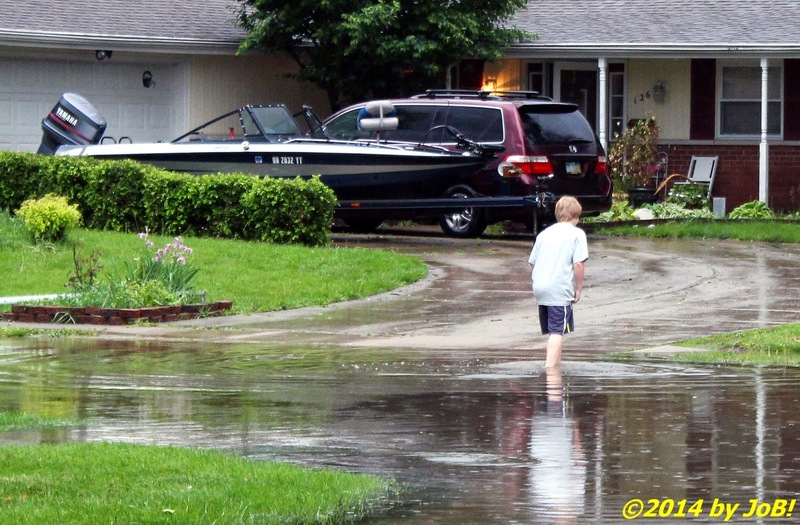 A young boy wades out into a flooded street during Wednesday evening's storms. When I walked over to that road, I could see that this was indeed the genesis of those noises. 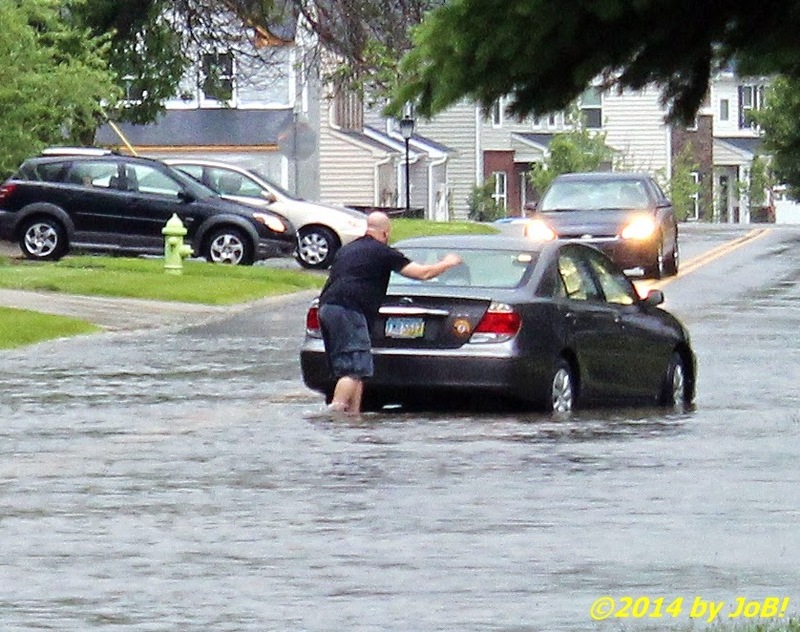 I saw one specific car hitting the moving water that caused the initial splashing sounds but it was what I found further up the street that attracted my photographic interest. 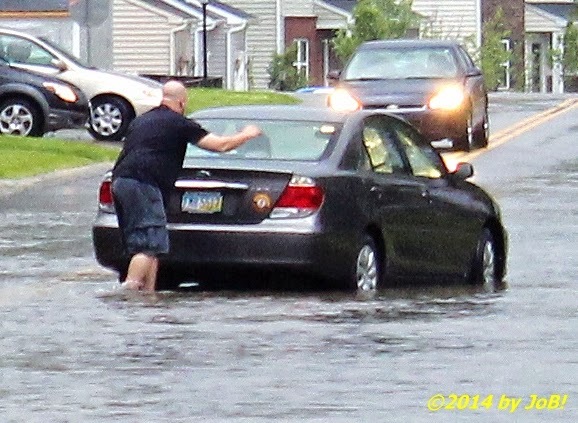 I could see that same oblivious driver standing in water halfway up to his knees trying to get his car out of that large standing body of sudden rainfall accumulation. 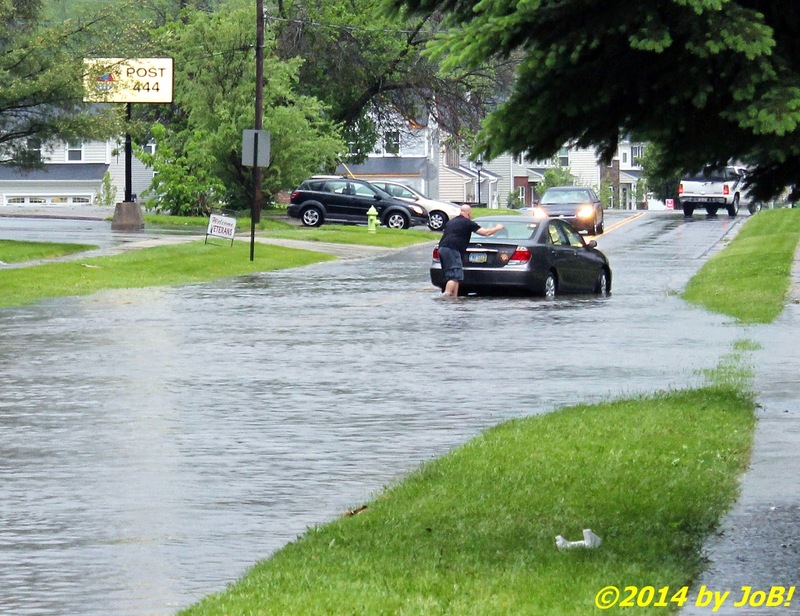 Apparently, he misjudged the depth and the car's engine stalled when it became partially submerged. Unfortunately, I didn't bring my telephoto lens on this jaunt but I was able to pare the photo down several steps to more closely document his avoidable predicament. As I tightened in on the driver and his stuck automobile, there seems to be a progression of the story. 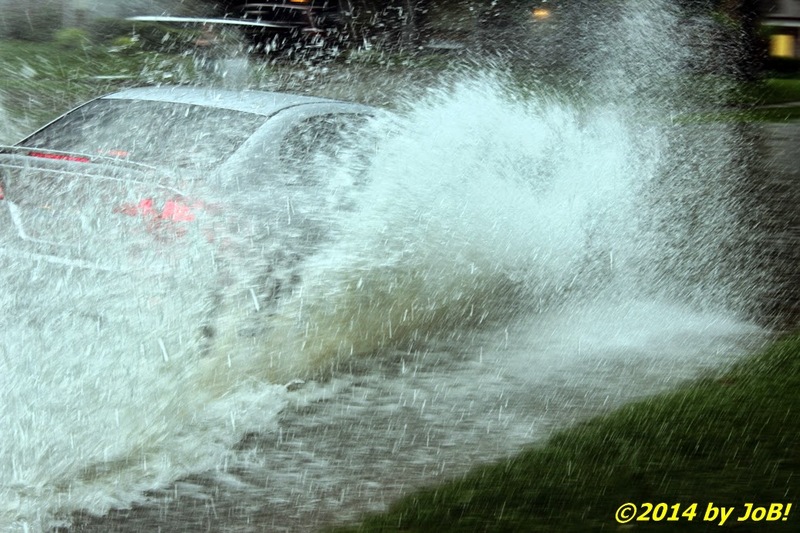 The original one introduces the wide scene of flooding and each successive version narrows the focus down to that one individual experiencing car problems. Six versions of the same photo but each one adds to the overall story in its own unique way as the primary subject grows in prominence. Another driver (the one facing him on the drier part of the street) came to his assistance and they were able to get the car out of the way of other southbound traffic on that road. Unfortunately, this motorist's lesson was not imparted to future travelers except for one older couple who decided to do a turn-around in a resident's driveway to go back the way they came to seek an alternate route to their destination. 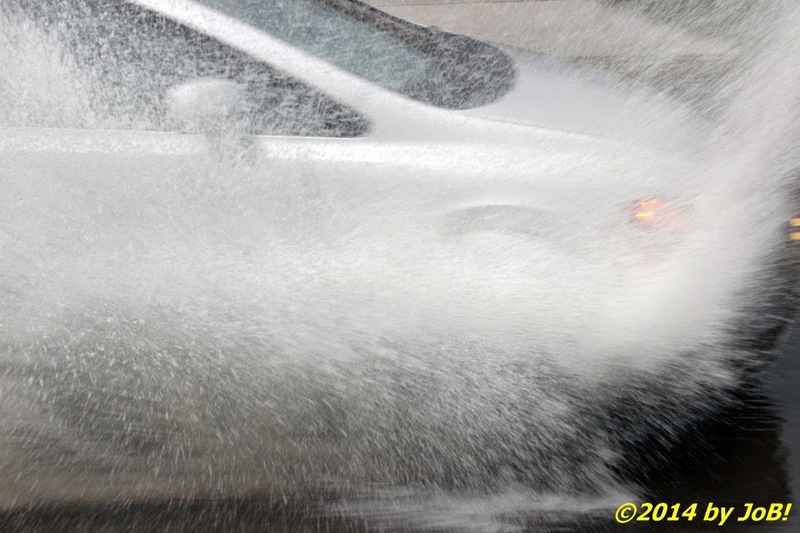 I got very close to the splash action and almost got doused by one car when the driver maintained the posted dry-pavement recommended speed limit as they approached the super-sized puddle. Some drivers felt more confident about their chances getting through the standing water left during Wednesday evening's storms. 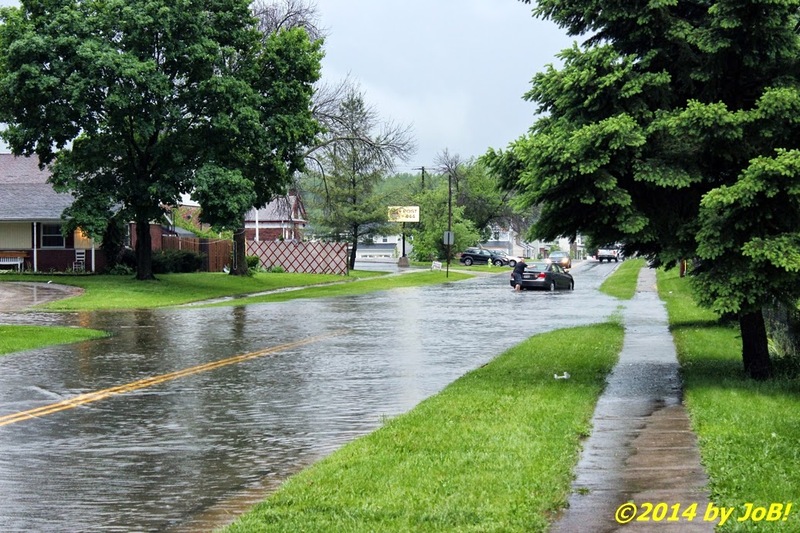 The photo I submitted to the WDTN site, in my opinion, was not the better one of the two that I took of that particular soggy scene. Since I am more familiar with WHIO-TV operations and more Cox Media Group Ohio personalities than those working for the LIN Media affiliate, I thought that I might get better exposure through their outlets (the television station and The Dayton Daily News). 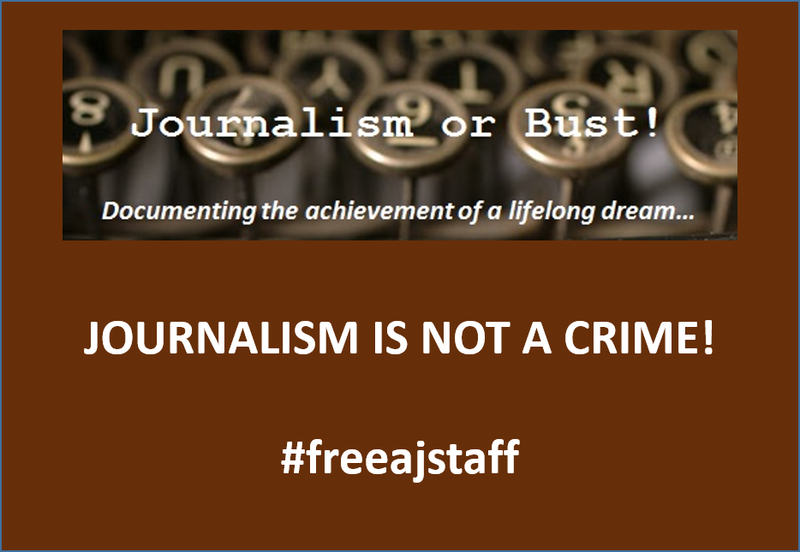 I opened up "citizen journalist" accounts with each organization (Report!t with WDTN and iWitness 7 for WHIO) and uploaded two closely related pictures for their exclusive use on their web sites and other outlets. The one submitted to WDTN is on the left; WHIO's is on the right. A closer view of the iWitness 7 submission. The one for WHIO was taken later and it shows the vehicle from the earlier WDTN shot making its way along the water-logged route. It also shows a second vehicle approaching me (I believe it was the same one that was facing north in the earlier photograph). 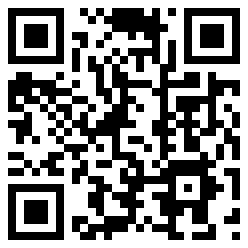 I like the later one more because there is more information conveyed to the viewer than in the first one. You have the meeting of the cars' water wakes dominating the center of the shot and the headlights of the approaching driver's car illuminates the surface of the standing water to highlight its dynamic texture. While not a perfect photograph (the horizon is too close to the center of the shot), I thought that it was definitely the better one. That's why it surprised me when I saw just how much WDTN used my submission with their web products (and the comparative lack of interest by the WHIO folks). 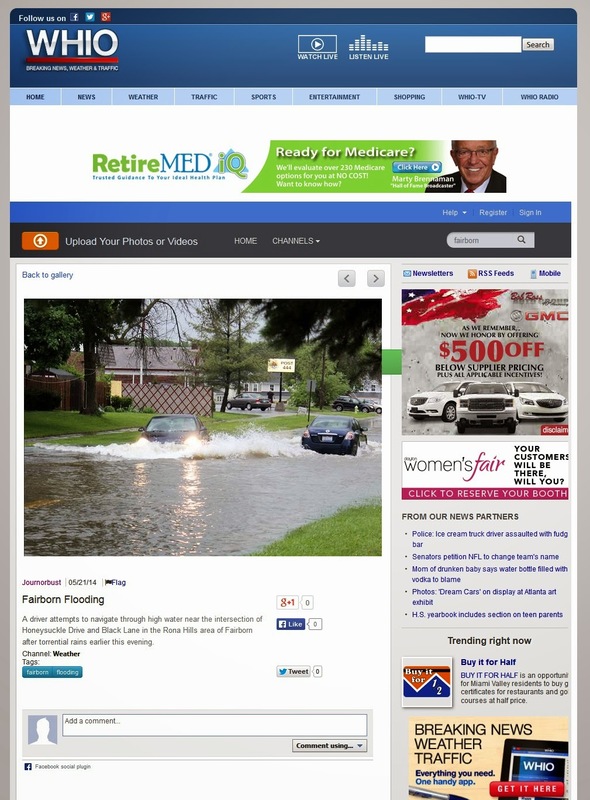 My photo was used on WDTN's main page as a "thumbnail" for the Thursday morning video covering the previous evening's flooding (even though my submission was never seen in that televised segment) (graphic courtesy of WDTN.com). My submission was part of a collection of photographs documenting the flood waters as a result of Wednesday evening's storms (graphic courtesy of WDTN.com). Another "thumb" used for that morning video at another location on the WDTN website (graphic courtesy of WDTN.com). 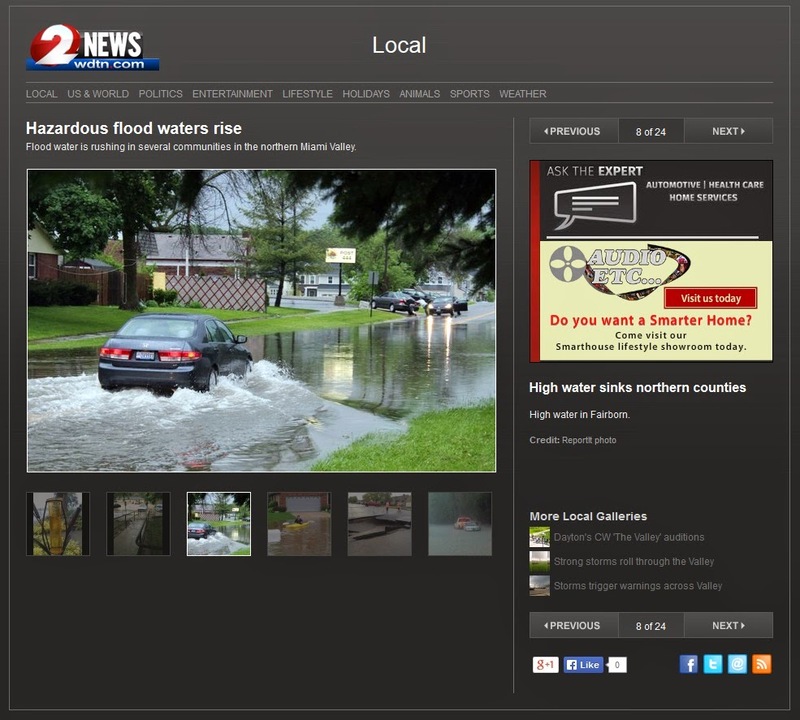 A dynamic screen capture of photos tagged for "Fairborn" and "flooding" on the WHIO iWitness 7 share page--mine is in the lower left-hand corner (graphic courtesy of WHIOTV.com). 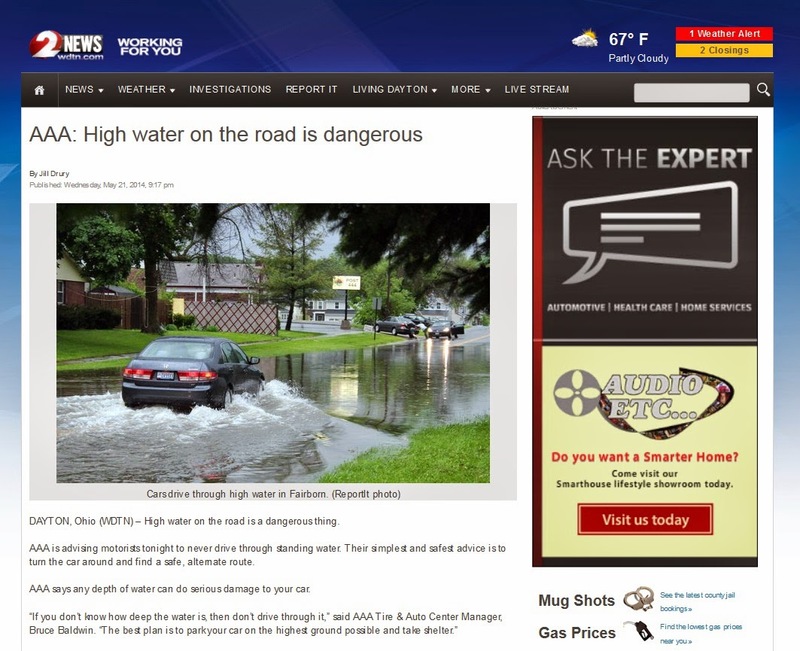 My submitted photograph (and accompanying copy) on my WHIO-TV iWitness7 page (graphic courtesy of WHIOTV.com). Needless to say, I was extremely excited to see my work featured on a web location other than my personal blog (I'm now following Jill Drury, the web producer who selected my submission out of the many uploads from that event for those particular locations and purposes). While I have documented many occasions requiring a lot of coordination and preparation prior to execution, this unplanned opportunity provided me the opportunity to participate in the much larger discussions about this unusually strong storm system that required barely 15 minutes of work. I'm hoping that this is an indicator of the progression of my photojournalism skills to the point where I can just grab my camera bag and respond to breaking news or an emergency situation. Yes, I do recognize that this was a "baby steps" moment but even the fastest runners had to take their initial fledgling strides at one time in their lives...isn't that why they call new reporters "cubs"?